The Oklahoma City Thunder are finding out the hard way that no team is immune to struggling late in the season. Can Paul George and company pick it back up before the playoffs? The length of the NBA schedule creates seasons within seasons. Teams wax and wane; in the past five months, there were stages at which the Rockets looked to be in real peril, the Grizzlies were on track for the playoffs, and the Lakers made a case as a credible Western Conference challenger. An entire month was consumed by the trade market for Anthony Davis, who was ultimately not moved—an outcome that plunged a superstar talent into purgatorial irrelevance. Over a long enough term, a brilliant scorer can burn out or a late-blooming prospect can find his way. No team is immune. Part of NBA life is accepting that the team that begins its journey with training camp in September will be materially changed by April. 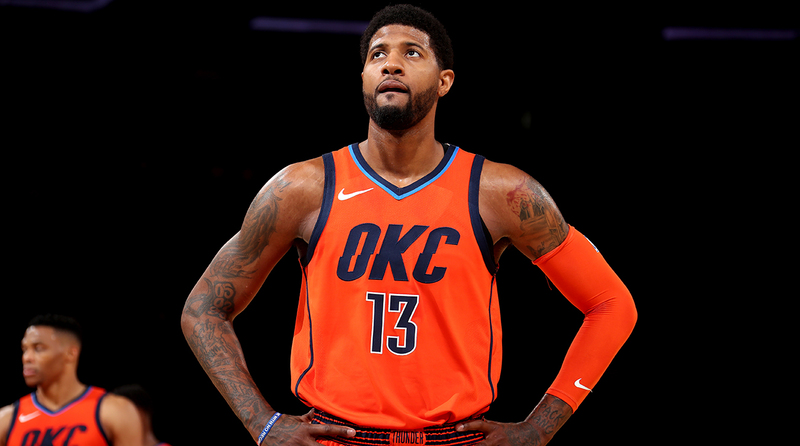 The reality of that change has hit Oklahoma City—and Paul George—with a particular weight. At the end of February, the Thunder held the third-best record in the Western Conference and George was locked in a three-man race for MVP. As of today, OKC sits seventh. The notion of hosting a playoff series fell away when the Thunder lost five of their last seven games beneath a sputtering offense. George is ailing. This isn’t the first time that George has logged heavy minutes (he ranks fifth this season in total minutes played) or carried so much responsibility for an offense, but managing both to this extreme in a conference that offers so few nights off has taken its toll. It’s unclear whether George will be able to even participate in Friday’s game against the Nuggets due to soreness in his left shoulder. Some manner of regression was always likely, if only because George had been converting jumpers at a level far beyond even his All-NBA standards. He wears it well; even in his injured form, George scored 89 points over his last three games, securing valuable wins over the Raptors and Pacers. Every win counts for the Thunder. One more will punch their ticket to the playoffs. Another few might get them into the fifth or sixth seed. The clutter of the West standings partly explains how OKC fell so far so fast, but it’s also what might prevent them from properly resting George between now and the end of the season. A single game could decide whether the Thunder end up on the Warriors’ side of the bracket. Then again, maybe planning for multiple playoff rounds presumes too much. In theory, the Thunder are compelling spoilers—two dynamic stars backed by a nasty, physical defense. Yet as Oklahoma City’s schedule has turned harsher in recent weeks, so too has their playoff viability. The architecture of the team remains largely unchanged, but the ceiling shows signs of damage. Any case for a deep Thunder playoff run supposes a capacity to play focused, elevated basketball—the idea that in a seven-game series, George, Russell Westbrook and Steven Adams will be able to control the margins and dictate terms. The last six weeks have told a different story. Since the All-Star break, the Thunder’s usually dominant starting lineup (+11.3 before the break) has actually lost its minutes on the floor by a substantial margin (-3.7). If a team can’t create separation with its best players on the floor, what can really be said of its ceiling? This could be a product of OKC’s tougher competition of late, of injuries like George’s, or perhaps some broader slump in performance. None bode well. The playoffs are two weeks away, which leaves precious little time for the Thunder (or any other team) to sort through their complications. In all likelihood, George will go into the postseason nursing minor injuries. Whichever team Oklahoma City plays will be formidable. The Thunder might still be capable of pushing through to the Conference finals, but so much of their performance will have to improve without the time or space to expedite it. George can still be incredibly effective, perhaps even the best player in a first-round series. Even that may not be enough for a team that has been outscored in George’s minutes since the break—the net rating equivalent of the Hornets or Timberwolves. For most teams, it’s not enough to have every core player in the lineup. Most need to survive an 82-game slog miraculously unscathed. A sore knee might compromise a key matchup. A sprain to a shooting hand can tip the balance of a series. Back spasms can trash a finely tuned defense. The balance is just too precarious. Even if George and the Thunder are able to recover in time for a largely healthy playoff, it’s possible that the damage will already have been done—that they’ll have lost the seeding and matchups needed to go far. The Thunder remain a tough out. What remains to be seen is whether the attrition of the season cost them the potential for more.